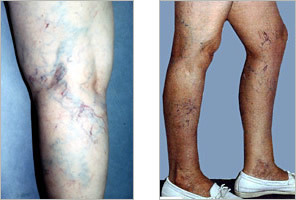 Spider veins (referred to medically as telangiectasias) and varicose veins aren’t the same. Varicose veins are large and swollen and occur singularly on the legs. Spider veins are much more delicate, tend to develop in clusters anywhere on the body, and are caused by irregular blood flow. They are thought to be induced by hormones and are often associated with pregnancy and menstruation. Although spider veins generally don’t have symptoms, the veins deeper in the skin that feed them may cause discomfort. Women are more likely than men to develop spider veins. Exactly what happens in the body that leads to spider veins isn’t certain, but there are several theories on what leads to the abnormal blood flow that causes them. One theory is that spider veins, which occur near the surface of the skin, are fed by underlying varicose veins that are either too small or too deeply embedded to reach the skin’s surface. These underlying veins disrupt circulation, causing spider veins to appear above them. Another theory is that spider veins are actually little arteries that join the network of veins closest to the surface of the skin. Because arteries are under high pressure and surface veins aren’t, the combination of arterial blood and venous blood would cause spider veins to become visible. While spider veins don’t usually pose a health threat they do make many feel self conscious. The vascular surgeons at the Advanced Vein Center are continually striving to provide the newest technologies available, thus improving outcomes, and reducing recuperation time and cost. Sclerotherapy is the most effective noninvasive method of treating medium to large spider veins. Other than what’s visible, there typically aren’t significant symptoms of spider veins. They may cause minor aching or discomfort, and some people have complained of a heavy feeling in their legs or legs that tire easily. Complaints may worsen with menstruation and warmer weather. Women develop spider veins nearly four times as often as men. In fact, about 70 percent of adult women get spider veins at some time in their lives. Some women are at greater risk due to heredity. Others are likely to get spider veins because of lifestyle. Women who are pregnant or use oral contraceptives are at risk for spider veins. So are women who experience an increase in estrogen, which is believed to weaken vein walls. Overweight women often get spider veins because they’re more likely to develop circulatory problems, diabetes, or heart disease. All these conditions hinder blood flow to the heart. Other minor factors include topical steroids, trauma or injury to the skin, and exposure to ultraviolet rays.